Following ordination, he served as associate pastor at St. Priscilla (1961-66) and St. Hubert, Hoffman Estates (1966-73); as resident and part-time associate at St. Justin Martyr (1973-78) and St. Cyprian, River Grove (1978-82). He served as pastor at Our Lady of Ransom, Niles (1982-94) and St. Giles, Oak Park (1994-2009). Since 2009, he has served as the retired senior priest at St. Pascal. Over the years, Dore has held various positions in church organizations including: Liturgy Training Publications, Office for Youth Ministry and Catechesis, Presbyteral Council, Catholic Cursillo Movement, Amate House, the archdiocesan Board of Consultors and the National Federation of Priests Councils. Fr. Dore has conducted numerous programs about Stewardship, including his current program: Stewardship in Action: Laying the Foundation for Intimacy with God. Pastor of St. James in Arlington Heights. Fr. Matt Foley joined Saint James Parish as its pastor in August 2013. Fr. Matt was ordained a Catholic priest of the Archdiocese of Chicago in 1989. His first assignment was to serve as associate pastor of St. Agatha located in the North Lawndale Community on Chicago’s West Side. During his service at St. Agatha, he focused much attention on teaching at the school and developing a gang alternative program called St. Agatha Family Empowerment (S.A.F.E.). In 1994, he was sent on a special assignment to Mexico to be a pastor of Santiago Apostol in Quechultenango, Guerrero, where he served the mostly indigenous farmers living in 26 villages over approximately 240 square miles in the mountains of the Sierra Madres. During his time in Guerrero, he began the El Nino Rey scholarship program that provides educational scholarships, dental services, and family assistance to the people of Guerrero. Fr. Matt continues to serve as the director of the board for this non-profit organization. In 2000, Fr. Matt became the pastor of St. Agnes of Bohemia Parish in Chicago’s Little Village, where he served for eight years. St. Agnes grew into a worshipping community of 6,100 attending 9 Sunday Masses. For the last five years, Fr. Matt served as the U.S. Army Chaplain the 101st Airborne Division. During his time as chaplain, he spent about 27 months in four deployments to Afghanistan; he completed his last deployment in late May 2013. Carol Fowler retired the summer of 2012 as the Director of the Department of Personnel Services for the Archdiocese of Chicago. She coordinated the work of 17 Archdiocesan agencies, which oversee all of the human resources functions for laity, religious, and clergy of the Archdiocese. The Archdiocese employs about 16,000 people. As one of the seven Archdiocesan department directors, she served on the Cardinal's Administrative Council. She served the Archdiocese in this role since 1991. Ms. Fowler was the President of the National Association of Church Personnel Administrators and served on the board of Regina Dominican High School. Carol is a member of the Board for the National Leadership Roundtable on Church Management. She was also a member of the Advisory Board of the Center for the Study of Church Management at Villanova University and a member of the Society for Human Resource Management. The Priest-Labor Initiative is an association of bishops, priests, scholars and supporters committed to standing with and advocating for workers, especially immigrant workers, who often are the most vulnerable. Founded in 2012 by the Reverend Cletus Kiley, a priest of the Archdiocese of Chicago, and the National Federation of Priests’ Councils, headquartered in Chicago, the Priest-Labor Initiative is a collaborative effort of Catholic Scholars for Worker Justice, Pax Romana, the Catholic Labor Network, Interfaith Worker Justice, the Kalamonovitz Center, the Monsignor Egan Center, the Conference of Major Superiors of Men, and the United States Conference of Catholic Bishops. Originally from McKinley Park, Jim has been working at the Teen Center for almost two decades. He knows the youth and just about everything about the area and Chicago. Along with running the Teen Center, he serves as the Youth Minister for Blessed Sacrament Parish. He would get a photo of Omar Castel lying dead on the pavement and he'd hang it on a wall in the Blessed Sacrament Teen Center. Let the kids see Omar's body. Let them be shocked, if shock was the only way to save them from Omar's fate.Let them see that this is where the gang life leads, to a bloody death on a street corner, two blocks from their teen center. In the end, Kozy didn't hang the photograph, but that leaves him not knowing what to do. "This was a savable kid," he said when I went to see him Friday in the South Side neighborhood of McKinley Park. He seemed weary. If you can't save the savable kids, who can you save? Holds a Licentiate in theology (S.T.L.) from the University of Louvain, Belgium and a Doctorate in New Testament Studies (S.T.D.) from the University of Louvain. A frequent lecturer across the country, Fr. Senior also serves on numerous boards and commissions. He is past President of the Association of Theological Schools of the United States and Canada. In 2001, Pope John Paul II appointed him as a member of the Pontifical Biblical Commission and was reappointed in 2006 and 2008 by Pope Benedict XVI. Fr. Senior is the General Editor of The Bible Today and co-editor of the twenty-two volume international commentary series New Testament Message. He is the General Editor of The Catholic Study Bible (Oxford University Press, 1990). He has authored and edited several books and articles. Donald Senior is a member of the following professional associations: The Catholic Biblical Association of America; The Society of Biblical Literature; Studiorum Novi Testamenti Societas; The Chicago Society of Biblical Research; The Catholic Theological Society of America; The International Association of Missiological Studies; Pax Christi International. The 47th Annual Mardi Gras Ministry Awards was a festive event with over 300 people in attendance. Pope Francis, January 30, 2014, twitted, I cannot imagine a Christian who does not know how to smile. May we joyfully witness to our faith. 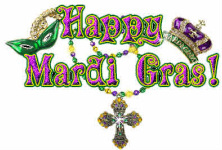 The ACP congratualtes all the Mardi Gras recipients for their joyful witness to the faith to the people of God for the Church of Chicago. Thanks to everyone who supported the ACP's celebration of ministry at our Mardi Gras. Your support for the ACP is greatly appreciated. Please consider placing an Ad in our Program Book. Ad Deadline is February 21. Thank You. Mary Burke-Peterson: attends Loyola University. She is pursuing a MA at the Institute of Pastoral Studies. Mary is an active member of St. Nicholas Parish in Evanston, where she has worked to develop a greater sense of lay ministry among parishioners, served as a liturgical minster, and led the Art and Environment Team. She has also chaired several fund rasiing campaigns for the parish. Esther Stanborn MDiv: is the Director of Campus Ministry at Saint Xavier University in Chicago. She is a graduate of Canisius College of Buffalo, NY, and the University of Notre Dame, IN. She is a former member of the Jesuit Volunteer Corps. She is active in the Catholic Campus Ministry Association, currently serving as chair of the Member Services Committee. She is certified as a campus minster by the U. S. Conference of Catholic Bishops. She plans to begin DMin studies at Catholic Theological Union this summer.